Sunday night, I attended a wonderful RoundTable meeting of volunteers of The National Inclusion Project. Aron Hall led the meeting which was lots of fun and full of so much information. We started the meeting with some great ice-breakers which gave us the opportunity to meet different people in the room. The thirty volunteers became relaxed and seemed to jump right in. Aron discussed many things with us. I took a few notes, but I am sure that he will be sharing the information with us through the Foundation’s web page. I am just going to list a few of the things that were mentioned……I wish my notes were more organized. Did you know that 5000 kids were involved with the National Inclusion Project this year? They will no longer be using the title of “Grant”. The organization does much more than just “grant’ money. They also give hands on training and provide a network system for the “grants”. No alternate name was mentioned. Job of volunteers has three parts. First, we are a mouthpiece; we share the story. Second, we are firestarters; we create enthusiasm. Lastly, we need to be an organizer. With the name change, it is wonderful that we can capitalize on the name……Inclusion. Challenge for the year…..Beta Alpha chapters together raise $200,000 in 2010!! Wait until you see the new “Painted Bottoms” project. It was wonderful to join with other volunteers and get ideas and excitement from them. There is so much we can do to support The National Inclusion Project. A BIG Thank you to Aron who met with us instead of having dinner with Clay at the Country Club dinner. I hope you know how much everyone appreciated the meeting. And another thank you to Diane and Jerry for stopping in after the dinner to say hello. 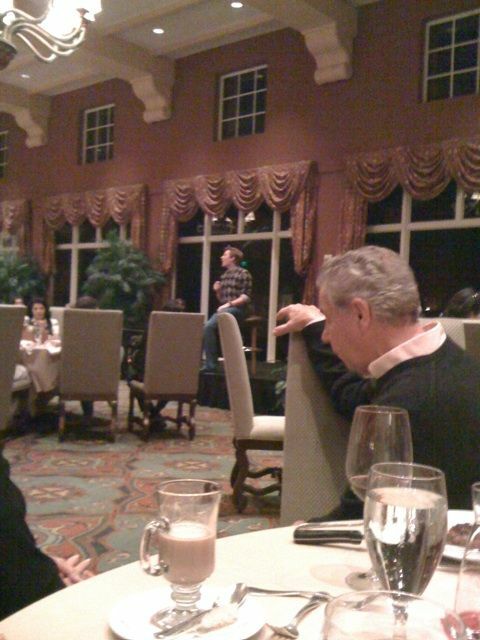 Speaking of Clay Aiken…………did you all see this picture from the dinner last night? It was reported that Clay sang 3 songs and they were all wonderful. Aron Hall hosted a Roundtable for “National Inclusion Project” volunteers here at the hotel. There were around 30 people in attendance. Aron spoke eloquently and from the heart about what he hopes “National Inclusion Project” volunteers will be-mouthpieces to “tell the story” of the project and it’s mission, firestarters to be enthusiastic about “National Inclusion Project” programs and fundraising activities and organizers to start local activities in our communities to support the “National Inclusion Project”. We participated in several activities to meet our fellow volunteers and to share successful projects and ideas from around the country. Diane Buble, Jerry Aiken and Kristie Barnes came in to say hello and thank you when they returned from the dinner/miniconcert for the Mirasol members. Diane assures us that Clay’s hair looks good and he sounds great. I’m looking forward to confirming that in person tomorrow! Thank you for sharing the round table discussion. I've attended them at the Gala's and they are exciting and thought-provoking. Clay Aiken – what a guy!!. Am proud of him, his foundation, and his fans for making a positive difference in the world. Wonderful picture taken of Clay last night in Florida. Thank you for that. It sounds like you all had a wonderful time at the Round Table Meeting for the NIP. Such a good cause, and as always attending meetings like these, it gets people worked up to help the cause. Clay's vision of Inclusion for all, is truly an inspiration and the foundation has done such good work over the years, and keeps growing. Many fans give their all to help, but we all know that Clay is so thankful for this. He has said it over and over again, that he could never say it enough, how much he appreciates what everyone does, but I guess the results are found in the faces of all children….Amazing…. The round table sounds like it was very informative. Can't wait to hear about "Painted Bottoms"
Thank you for the report from "sunny" (ha!) Florida. Enjoy the evening with Clay Aiken, the best pretend boyfriend anyone ever had. Thank you for sharing highlights from the Golfing for Inclusion round table meeting. Looking forward to your GFI and Clay Aiken reports! Have a great time — and stay dry! Interesting – Painted Bottoms, huh…. Thank you so much for posting these. Am so jealous of you right now you don't know. Hope to get more news from you soon. I like what someone says up there… that Clay is the best pretend boyfriend anyone could have. LOL. Good one. Thank you for the summaries of the NIP volunteers' roundtable meeting. NIP is a terrific organization! I'll look forward to learning more about their initiatives for 2010. Clay Aiken's efforts to promote inclusion are one of the many reasons that I'm his fan. Thank you for sharing the Round Table information. Looking forward to see what the "painted buttons" are all about. It is great that NIP was able to help so many kids. Too bad that it is raining today in West Palm Beach and that the golfing had to be called off. Hope tonight goes really well for NIP. Thank you for the great report on the roundtable discussion. It's thrilling to see the NIP grow and thrive! Clay Aiken and Diane Bubel must be thrilled to see how much success the organization is having. Kudos to all the fans who have helped thru donations and volunteer work. Thanks for the recap. I love it that 7 years later the foundation continues to grow and spread inclusion. Error: Error validating access token: Session has expired on Tuesday, 21-Aug-18 16:13:01 PDT. The current time is Wednesday, 24-Apr-19 22:02:18 PDT.